Requirement: Ensuring code quality and verification in production lines to avoid downtime and failures, while enabling full traceability of parts and production processes. Project: Barcode quality checks and verification in ASYS marking and handling machines using integrated barcode imagers. Solution: Quadrus MINI and MINI Hawk imagers from Microscan integrated in ASYS machines decode linear and 2D codes to carry out quality checks, connected to ASYS systems using the Easy Setup Program (ESP) from Microscan. Result: Reliable code quality for production lines, resulting in minimized downtime and full traceability. Continuous innovation and integration of new technologies are key factors for ASYS to meet their customer requirements for higher throughput, higher efficiencies and reduced manufacturing cost. ASYS integrated multiple code checks and verification using Microscan barcode scanners and imagers in their laser marking, handling, labeling and assembly machines. This ensures best code quality and verification in production lines, helping manufacturers to avoid downtime and failures, while enabling full traceability of parts and production processes. The ASYS Group is an international company that focuses on the design and manufacture of handling, marking, depaneling and custom systems, as well as screen and stencil printers for the electronics manufacturing and photovoltaics industries. The group’s business activities, in more than 40 countries, are managed from the company’s headquarters in Dornstadt, Germany. The ASYS Group brand delivers the same high standards of quality and workmanship all over the world that customers have come to expect from products “made by ASYS“. Manufacturing sites in Germany and in Singapore, as well as multiple local Sales and Service offices around the globe allow ASYS to take care of its customers 24/7. ASYS places great importance on quality. Their customers, especially in the automotive industry also request proof of the quality of the codes that are marked or printed in their manufacturing lines. The last thing a manufacturer needs is downtime due to a failure because of a barcode that cannot be read. If for example a printed circuit board Microscan imagers provide guaranteed quality and traceability for manufacturer of handling, laser marking, and labeling systems (PCB) cannot be scanned, it cannot be traced and has to be removed from the line, along with any components already assembled on the board. This is very costly, and a major reason for ASYS to place extra attention to the end quality before a code is passed further in the production process. Therefore, ASYS needed a scanner that can handle any reading challenge. For verification and quality assessment, a fixed barcode scanner needs to be integrated inside the labeling or printing machine to make sure that the quality of the printed code is correct, as well as to ensure that the information read from the code is correct. Together with Microscan elite partner WI-SYSTEME GmbH, they found the ideal solution to the requirements. WI-SYSTEME GmbH distributes and integrates 1D and 2D barcode readers and verification devices, vision systems as well as industrial lighting. 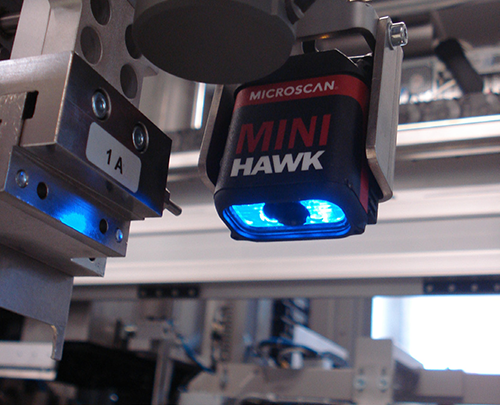 A MINI Hawk Imager ensures code quality and verification in handling, marking and labeling machinery. In order to carry out the quality checks, ASYS machines scan the codes with barcode readers, both inline and offline. 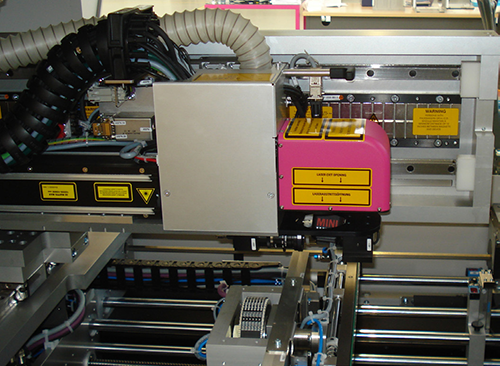 First a code – most often Data Matrix – is printed in the laser marker, or in the labeling machines. The code is verified by checking that it is available after marking, and then to see that the code quality meets the predefined standards. The part will be passed onto the next process once a confirmation is received that the information sent matches the information read. Second part of the traceability solution is carried out with handheld scanners. The order number, batch number and quantity is read from a sheet with the scanner, and the information is passed to the laser marker. The operator will load for example the laser marking system with a certain number of boards, and the correct code content can be marked on the boards. ASYS machines also carry out additional traceability checks using barcode scanners and imagers. On the production line, codes on the boards and housings that go into a machine can be scanned, and other information can be married to the board, for example regarding its components. Other machines in the production line can count the parts that they have received, and inspection machines can inform the operator regarding failed boards, so that they can be repaired without delay. 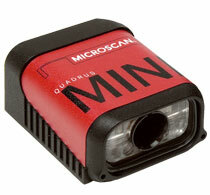 The Quadrus® MINI imager was recommended to ASYS by WI-SYSTEME when it was first introduced in late 2005. The imager reads all standard 2D and linear barcodes, and it can also decode multiple codes per capture. In addition to its reading performance, a major benefit was its small size, measuring only 25.4 mm x 45.7 mm x 53.3 mm and weighing 57 g.
“In the automotive industry, footprint is very valuable. We are continulously looking for ways to reduce machine size,” said Mr. Swen Nothjunge, Product Manager for Marking Systems at ASYS. “When Microscan launched the Quadrus MINI, we quickly realized its reading potential and saw that it could easily be integrated into our machines.” The Quadrus MINI has now served ASYS well for several years. 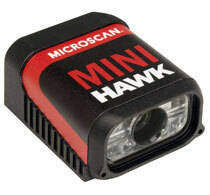 In the summer of 2012, ASYS began implementing the MINI Hawk imagers in their machines. With multiple resolutions and high speed configurations available, there Application Case Study: ASYS, Dornstadt, Germany is a MINI Hawk imager to solve virtually any challenging application. “We plan to recommend the MINI Hawk to our customers from now on thanks to its reading performance,” Mr. Nothjunge continued. “If we have a special application need, we can also for example implement the QX Hawk, or MS-3 scanners from Microscan.” If ASYS customers have other preferred scanner suppliers, ASYS can naturally respond to those requests, but Microscan is their first choice for scanning needs. Microscan scanners and imagers can be integrated into ASYS machinery based on customer requirements. Another feature that ASYS was impressed with is the autofocus functionality, which offers real time dynamic autofocus, where you can simply position the symbol at the center of the field of view, and push the EZ button. The imager automatically adjusts focal distance and sets internal parameters to optimize the symbol. Compared to laser scanners, imagers can also be integrated at a steeper angle in the machines. In addition to the most aggressive decoding available, the X-Mode technology in the imagers provides easy setup, calibration and deployment in any application. Manufacturers request more and more traceability from their production lines. First, the quality checks were carried out in the marking machines, then on scanner conveyors as well, and now barcode scanners or imagers are integrated in most ASYS machines in the production facilities, including assembly lines. This enables the manufacturers to stay up-to-date on any activities going on in production. ASYS has been impressed with the easy out-of-box experience that the MINI Hawk offers. With the MINI Hawk, they are able to read codes on the fly, carry out quality assessment and checks, decode linear and 2D codes, and more. The MINI Hawk delivers good reading performance on all codes, and ASYS will recommend it to their customers as their preferred choice. 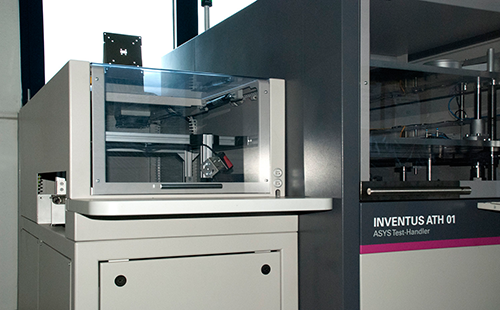 The Quadrus MINI and MINI Hawk are used for example in the INVENTUS Automatic Inline Test Handlers from ASYS. Microscan actively supports both technologies and strives to address customer applications appropriately and without bias. We continue to develop innovative solutions using both lasers and imaging for barcode applications as we expand our growing portfolio of machine vision systems, machine vision lighting, software, and hardware solutions.